Maslow helped us rank our human needs and as students and teachers we sometimes forget why that is important, meeting our needs is a primal force that often operates below our consciousness. Raising those needs to our conscious perception can impact the way we arrange our learning and troubleshoot when things go wrong. 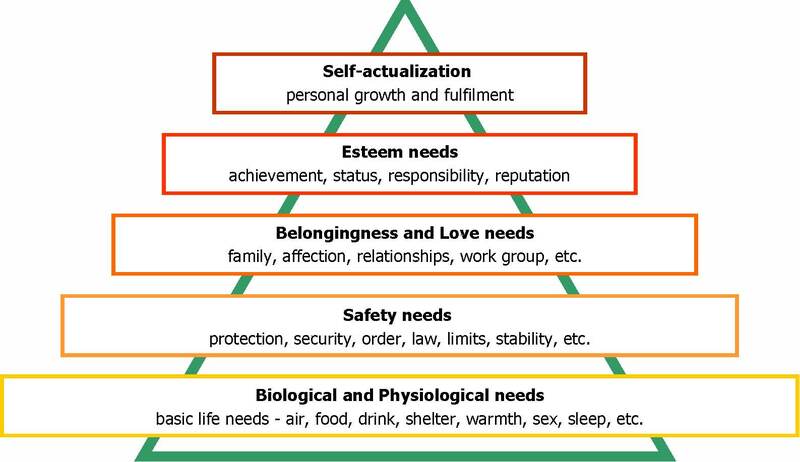 According to Maslow, we have physical and safety needs that trump other needs like growth or esteem needs. We have seen the effects on people who don’t have what they need and how it warps them. But we often don’t look at situations for the need satisfying value that they might have. Some instructors think more about the content they are teaching than the context of the learner whom they are attempting to teach. Some teachers and administrators think concentration on the needs of their learners to be “touchy feely” and frankly, unnecessary. As students and teachers, we can overlook our needs and see them as extras or wants. My students often tell me that while they believe that food and water would be needs, having companions is not a need. I remind them that all humans come into the world connected to another person, literally and that without help until at least about the age 5 – 7, most human children would die if left totally on their own. When learning or teaching or working, we should look for and encourage environments that satisfy the greatest number of needs. Need satisfying environments give us what we often seek and those things are beyond money or material things. In fact, most are not. This goes almost without saying. If you are hungry or cold or homeless, you will not be thinking about quality learning or work. I have had a number of homeless students or students who were experiencing some other basic for of deprivation, but they wanted to continue their educations. I can tell you, without a stable environment, they were just going through the motions. Even those of us with reasonably stable situations need to be on the lookout when our basic health and well-being or that of a fellow student is not being care for that it will negatively and immediately influence learning and working. From a less extreme situation, recall a time when you were trying to learn when you had to use the restroom or you were starting to get sick. How much were you actually retaining of what you were supposedly learning? While this seems outside of what normally happens in a class, I have heard from many students that they have been in schools where they constantly were in fear for their lives and safety. It was a preoccupation that never allowed them to settle in and trust the best intentions and lessons that a teacher might have. Think about your own self. If you are in a place where you have to make a lonely walk in the dark after a night class or cars are being broken into in the parking lot, that can influence your decision to attend classes. Fear can loom large and can crowd out a student’s ability to focus on the learning or work at hand. This is where my students usually have a problem. They think that we don’t need each other. I try to get them to look at the positive. I ask them to think about what it feels like when they do belong or they feel that sense of belonging to a group, even if it is with the people who smoke weed in the parking lot, they all need to feel like there is somewhere that they fit in. I tell them to make friends in class. Friends make people more likely to learn or care about what is happening in class. It pairs experiences we want to have with information we might need to learn, but often when people want to get better at learning something, we don’t tell them to go out and make friends with others who are trying to do the same thing. While these can be combined in a variety of ways, I find that people who have a sense of purpose and feel empowered to accomplish the things they set out to do are happier and learn better and faster than those who feel aimless and have efforts thwarted. While it is true that some of this would be based on an individual’s outlook and personality because some people naturally are more positive and resilient in the face of adversity, but schools and classrooms can and should build purpose into activities and learning. Think about a time when you have been asked to do something that you consider to be pointless or when you have worked really hard on something only to have your efforts go unrecognized or blocked. That is not something that you look forward to. If purpose and the ability to achieve purpose is available, people become animated and connected to what they are learning. Maslow calls this self-actualization, but I call it learning and I equate it with fun. I believe that what we call fun is a state of mind where our conscious self-perception (or just thinking about ourselves) and we just experience what is going on around us; we become totally absorbed and the perception of the passage of time disappears. This rarely happens in classrooms. These are usually the places where people state at the clock waiting for torture to end. But I think all of us have gotten pulled into an interesting subject, movie, book, person, sporting event when our consciousness was totally engrossed. Think about how much you could learn if you were in that state all the time. Teachers can create these spaces in classrooms and students should seek out teachers who can do this. I have some specific ideas about how this can be done, but let me hear what some of the rest of you think. Add something to the comments section.